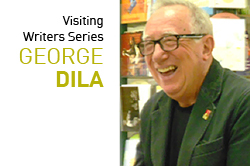 Kalamazoo Valley Community College’s “About Writing” Visiting Writers Series presents author George Dila, Thursday, November 8, 2012 in the Student Commons Theater, room 4240 at the Texas Township Campus. At 10 a.m. he will present a craft talk on what makes a good short story. At 2:15 p.m. he will read a selection from Nothing More to Tell. Dila’s stories and personal essays have appeared in North American Review, Driftwood, Palooka, Third Wednesday, Current, Traverse, Literal Latte, Christian Science Monitor and other publications. A native Detroiter and graduate of Wayne State University, George now lives with his wife Judith in the Lake Michigan coastal town of Ludington, where he directs the activities of Ludington Visiting Writers, a literary program he founded in 2001. He is also the fiction editor of Third Wednesday, a quarterly literary journal. KVCC’s “About Writing” series is orchestrated by instructor Rob Haight and offers students the opportunity to dialogue with professional writers and listen to their work.